How Will Artificial Intelligence Transform Recruiting Practices? In the ongoing debate of what artificial intelligence will automate and replace next, recruiters have become a hotly debated target. A hire can make or break the success of a team; which is why companies annually invest hundreds of thousands of dollars into outsourcing its hiring. But what if they could automate those practices and spend the surplus budget on other things? Back in 2000, everyone was excited about Monster.com for a somewhat similar reason. You could post a job and collect ad response from hundreds of candidates, or search through resumes for the perfect addition to your team. There was nothing like it that could connect you to people so quickly. It was expected to completely revolutionize hiring and make third party recruiters irrelevant. Well, it’s 2018, and third-party recruiting isn't gone yet — and we’re betting the agency model will survive AI, too. But, the real question is, why? Why is recruiting so difficult to replicate and automate? Recruiting is a relationship-based business; recruiters will recommend roles to a candidate that they might not have looked twice at while scrolling through a job board. Seasoned recruiters have inside detail on what makes a role or company unique, and an intimate understanding of how an opportunity will fit what the candidate is looking for in their next role or career move. 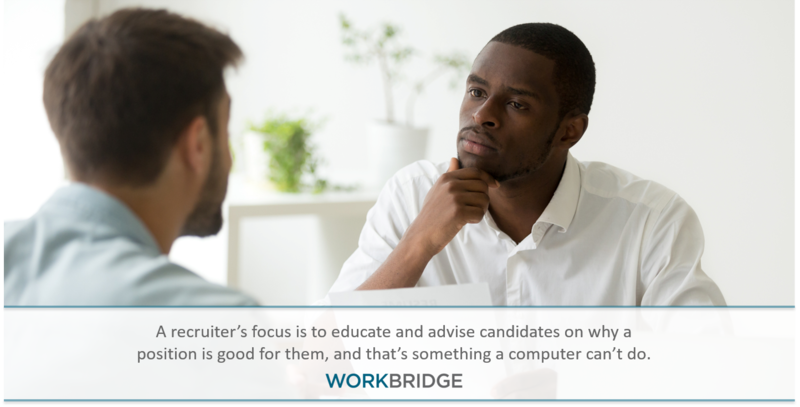 A recruiter’s priority is to educate and advise candidates on why your position is good for them personally, which computers inherently can’t do. Conversely, they may submit a candidate for your open tech role who doesn't have 100 percent of the desired skills. Rather, they recognize that the candidate will mix well with your existing team, or possess an aptitude and drive to learn and grow in the right environment. A good recruiter is not only a matchmaker -- they’re a coach and confidant. They will understand the vision you have for your team and customize their search for your hire accordingly. They’ll understand the importance of a culture fit, diversifying talent, skill-sets, and voices to make a team they support as strong as possible. They will advocate for the best interest of a candidate and company, which is a feature that AI can’t offer. Ultimately, recruiters possess one vital factor that artificial intelligence can't compute; why the sum of a candidate's experience is wholly greater than their parts. AI is only as intelligent as the data it draws from. When a machine makes data-based conclusions, the result will be only as accurate as the inputted data. As this data is still supplied by humans, it's vulnerable to becoming corrupted by subjectivity. In your hiring process, if you have historically hired a specific type of person for a role, an AI program will suggest similar candidates -- limiting your exposure to new ideas and perspectives. A great recruiter will challenge your perception on who the right candidate would be, offering you instant access to their diverse network of IT professionals. The key to analyzing data is context, and we’re still some years away from a machine being able to provide just that. We’ve seen this with mapping technology. You hear about people getting lost in the Australian rain forest, or driving off cliffs because they rely solely on an automated map telling them where to go instead of augmenting that data with common sense. So, if AI can’t yet fully replace recruiting, what can it do? In short, when used in partnership with strong hiring practices, AI can help make recruiters more efficient at their jobs. AI and data can help recruiters make better decisions about what types of accounts or roles to prioritize. 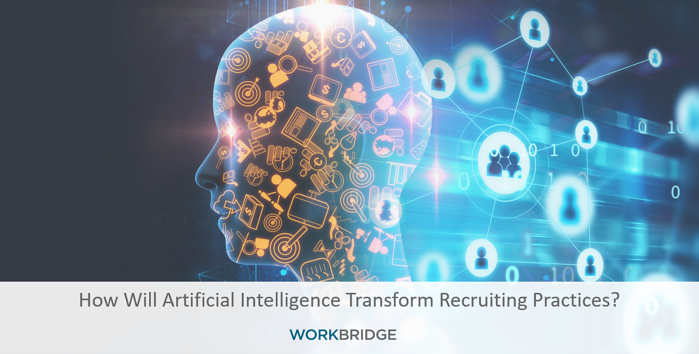 AI can catalyze lead generation and replace basic functions of a recruiter’s role, like sourcing new candidates and setting up interviews. Alleviating their schedule from these manual tasks leaves recruiters free to focus on building stronger relationships with candidates and clients to better service them. AI can even help replace or supplement certain communication touch-points, when appropriate, through email automation. The important thing to remember is that as efficient as it can make you, AI isn’t a stand-in for real, human interactions. Recruiting is all about relationships, which is why a live contact is imperative to successfully understand and recruit for an employer’s open roles, just as a candidate still values recruiters for their advice on how to navigate their career. AI can be incredibly potent key to success for your business. But that, in itself, is the key: AI is a tool — not a solution — to the problem.